Days later and no sign of Flight 370. How can a Boeing 777-200ER passenger jet go missing? Hugh Dunleavy, commercial director of Malaysia Airlines, speaks to journalists at a Beijing hotel where relatives and friends of the missing flight’s passengers are staying. No wreckage has been discovered. A Malaysia Airlines flight took off in route to Beijing, China with 227 passengers and 12 crew members on board – including two adult Americans and an infant. There is no word on the whereabouts of the plane, it simply vanished. A search and rescue team has been deployed to locate the aircraft, in hopes of finding that all passengers are safe. 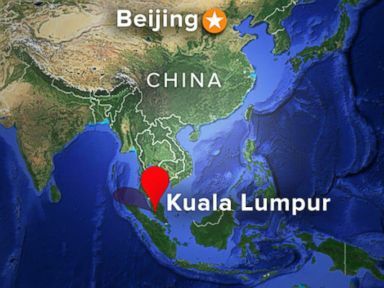 Flight MH370 departed Kuala Lumpur at 12:55 a.m., and was scheduled to land in Beijing at 6:30 a.m. It went missing two hours into the flight and disappeared off the radar northwest of Kota Bharu, Malaysia, in the South China Sea, at 6°33’05.4″N 103°20’39.5″E. Due to leads not supporting the location of the flight, search and rescue will expand the search area. A larger portion of the Gulf of Thailand between Malaysia and Vietnam will be searched. “We deeply regret that we have lost all contacts with flight MH370. Malaysia Airlines is currently working with the authorities who have activated their Search and Rescue team to locate the aircraft. Our team is currently calling the next-of-kin of passengers and crew.” – Ahmad Jauhari Yahya, airline chief executive officer.